Maldivian Democratic Party’s spokesperson and Maafannu-North MP Imthiyaz Fahmy’s passport has been held. His passport was held after the Criminal Court’s judge Ali Adam issued a warrant Thursday. According to the warrant, MP Imthiyaz's passport is being held as he encouraged people from other islands to come to Male and join in the protests during the state of emergency. 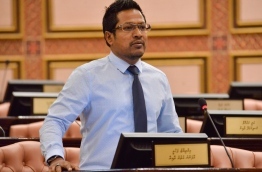 The police are also investigating the case of MP Mohamed Ameeth and Adhaalath Part’s media committee’s chairman Ali Nazeer, who voiced the same sentiments in the press conference. Nazeer’s passport was also held in relation to this case. The police stated, in court, that they have received information that MP Imthiyaz is planning to flee the country, bringing their investigations to a stop.